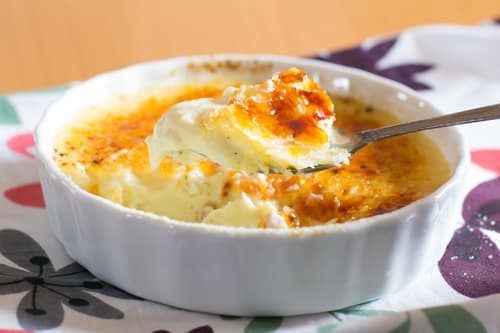 Classic Creme Brûlée is made from just four ingredients, heavy cream, egg yolks, sugar, and vanilla; resulting in a rich custard topped with a layer of hard caramel. 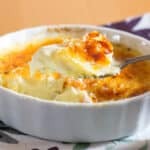 Also known as burnt cream, crema catalina or Trinity cream, Creme Brûlée is a dessert guaranteed to impress your guests. I’m excited to teach you how to make Creme Brûlée with this tutorial today. It is surprisingly simple to make and once you’ve tried making it yours, you may never be tempted to order this treat at a fancy restaurant again. I can’t believe it took me so long to finally make creme brûlée at home. This turned out to be one of the easiest desserts I’ve ever made! Classic Creme Brûlée is nothing more than a simple custard base topped with a crunchy layer of caramelized sugar. If you’ve never made custard before, it’s a blend of egg yolks, heavy cream and sugar lightly flavored with vanilla. While Creme Brûlée is an undoubtedly elegant dessert, it’s also a fairly simple concept with just a few ingredients. It’s also a dessert that just about everyone loves. I can’t imagine anyone not being over the moon to see a beautiful dish of perfectly caramelized Creme Brûlée placed in front of them at the end of the meal. This easy Creme Brûlée was such a hit that I know I’ll be making it again and again for many occasions. This recipe can serve as many as eight people, depending on how big your serving dishes are. Because Creme Brûlée is served in individual portions it’s also a great option for a buffet style gathering. Guests can grab their own dessert without the need for extra serving spoons or dishes. Creme Brûlée is traditionally served in round ramekins. If you don’t have Creme Brûlée dishes, small shallow serving dishes of any kind will do but be sure they are oven safe! This easy Creme Brulee recipe is also a great make ahead dessert. You can prepare the custard as far as three days in advance and store it in the fridge until ready to use! Place the filled dishes into an oven safe pan and fill with water to about halfway up the sides of each dish. Place on the middle oven rack and bake for 40 minutes. Carefully remove the very hot pan of water from the oven and let cool 10 minutes before transferring the custard dishes to the refrigerator to chill. Refrigerate at least 2 hours and as long as 3 days. When ready to caramelize, set the dishes on a heat resistant surface and let them warm for about 30 minutes. Sprinkle each dish with about 1 tablespoon of sugar and then use a kitchen torch to caramelize the sugar. A good technique is to go over the top of the dish until most of the sugar has melted, then let that cool while you repeat with the other dishes. Then finish each dish with a second torching. Don’t be afraid of slightly burning the tops, make sure you get the sugar good and bubbling. (If you do not have a kitchen torch and don’t plan to purchase one, follow the tips below for caramelizing the top with the broiler in the oven.) Chill the finished creme brûlée once again until ready to serve. Enjoy! Move the top rack in your oven up as high as it will go. Place the ramekins in the oven on the top rack, and turn on the broiler. Broil for 5 to 10 minutes, rotating them frequently so that they broil evenly. Take them out when they are golden brown and bubbling. Looking for more easy and impressive desserts? For a fun spin on classic brulee, give Summer Berry Brulee a try. Easy Crock Pot Dulce De Leche is another dish with an incredible caramel flavor that’s surprisingly simple to whip up. As far as impressive dessert dishes, it’s hard to do better than Marinated Strawberries with Dessert Crepes. These can totally double as an indulgent brunch recipe too! And for something even fancier, check out these jaw droppingly gorgeous Raspberry Souffles by A Beautiful Plate. 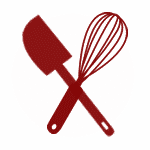 You can also find a full list of delicious Gluten Free Dessert recipes right here. Refrigerate at least 2 hours and as long as 3 days. When ready to caramelize, set the dishes on a heat resistant surface and let them warm for about 30 minutes. Sprinkle each dish with about 1 tablespoon of sugar and then use a kitchen torch to caramelize the sugar. A good technique is to go over the top of the dish until most of the sugar has melted, then let that cool while you repeat with the other dishes. Then finish each dish with a second torching. Don't be afraid of slightly burning the tops, make sure you get the sugar good and bubbling. (If you do not have a kitchen torch and don't plan to purchase one, follow the tips below for caramelizing the top with the broiler in the oven.) Chill the finished creme brûlée once again until ready to serve. Enjoy! I've always wanted to make this, I even have a torch that I'm a little afraid of. Will have to try now. Thanks! I'd love to make this --- I bought a cheapo torch that never worked, so I need to go out and get a real one...I love the creamy look of this! This is one dessert I've never made, and always order at a restaurant. I think it's the torch that keeps me from trying. I'll have to give it a try! Thanks for the inspiration! 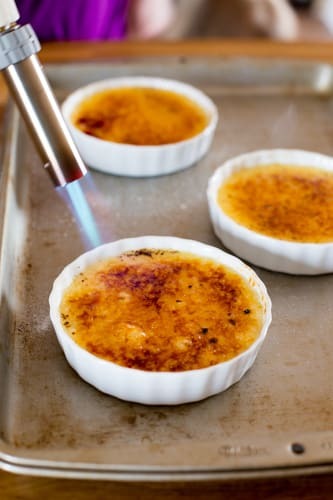 I made creme brulee like 20 times when I first got my kitchen torch.. lol.. it is so much fun to make, and of course, as you said, sooo easy!! Unfortunately, I haven't made it in a while... think I might need to make it for a treat this weekend! This recipe is awesome! I was so excited to try another Creme Brûlée recipe because you've got such good recipes on this site. I have made Creme Brûlée in the past which has turned out with a more cheesecake texture than the creamy custard I was looking for. Not this recipe. It's so easy and the result is the perfect creamy texture and taste that I was looking for all along. My husband said it tasted similar to vanilla ice cream. I will definitely be adding this to my recipe box as a keeper. Thanks so much Mary for this wonderful website!!! I can always count on you for great recipes. This is one of my fave desserts. I'm a sucker for custard every. time. But I use a burly blow torch to caramelize the top because I'm married to Mr. No-Unitaskers! Creme brulee is one of my favorite. Yours looks perfect. Great gluten-free ideas! Thank u!! !